Audi has introduced the new RS 4 Avant at the 2017 Frankfurt Motor Show. 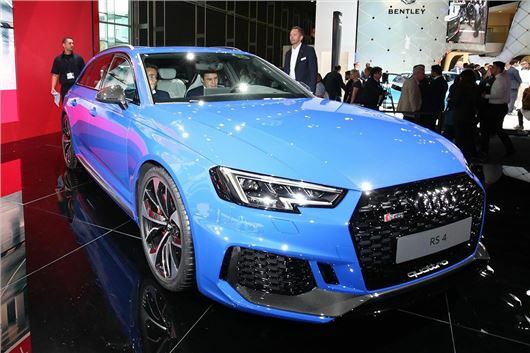 It uses the same 2.9-litre V6 as the recently launched RS 5, with 450PS and 600Nm of torque. Prices start at £61,625 and first deliveries are expected in the UK from early 2018. The twin-turbo engine produces peak torque from 1900rpm right through to 5000rpm, so there’s massive punch almost regardless of gear. The transmission is an eight-speed tiptronic, with power sent to all four wheels via quattro all-wheel drive. 0-62mph takes 4.1 seconds and top speed is limited to 155mph, though this can be raised to 174mph as part of the optional RS Dynamic pack. Probably not that important if you commute on the A1, though... Efficiency isn’t exactly the most important thing when buying a car this quick, but officially it’s capable of 32.1mpg. All the usual RS styling cues are present – there’s a big, honeycomb grille, wider wheel arches and twin oval tailpipes, while inside there are RS trim elements and bucket style seats. It’s still a plush, comfy and practical car though – just a really fast one. As standard, UK cars come with Audi Virtual Cockpit – a fully-digital instrument binnacle – as well as a sport differential and 19-inch alloy wheels. 20-inch alloy wheels are optional, along with dozens of colours, upholstery finishes, interior inlays and other extras.